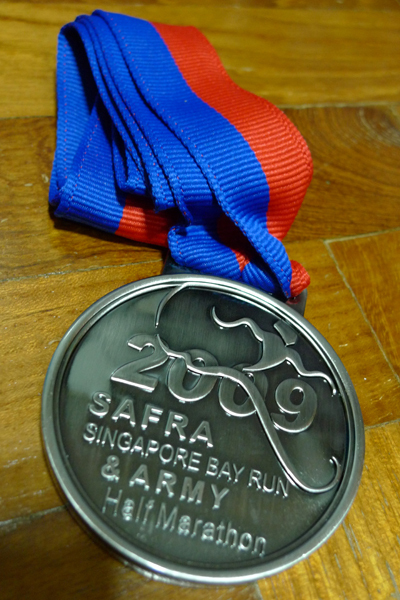 Today is the day, Safra Bay Run & Army Half Marathon 2009. Woke up at 5am to prepare for the run. Took a bottle of 500ml 100plus and a vanilla flavoured PowerBar. Everything has been packed last night. and most importantly my number tag. The disposable champion chip was also secured on my shoe last night. 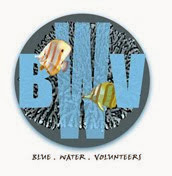 I read on sgrunners' forum that drinking a glass of salt water will prevent cramps. So I decided to give it a try and surprisingly, today's run was almost a no cramp run. 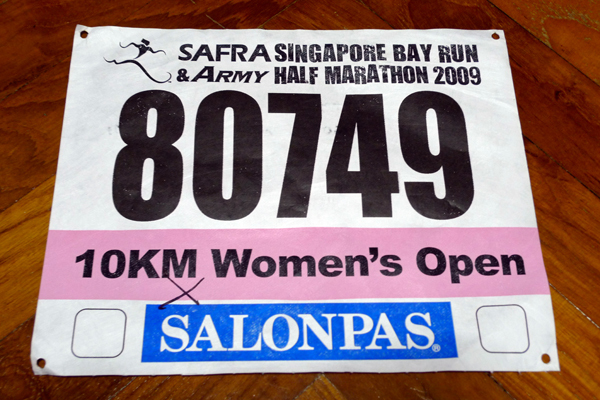 Almost because after I crossed the finishing line, the muscles just above my left heels started to cramp. The run started late and the crowd was huge, with so many army men. Just as I was about to reach the starting line crowd, the run had started. I feel that I under performed by a bit as I did not hit the "first 1km no stopping" target. Furthermore, I began to realise that my right feet was numb after reaching near the top of Shears' Bridge. The numbness continued till just past the foot of the Singapore Flyer and thus, I was unable to run properly during this period. Every time I start running, the numb on my right feet got worst. 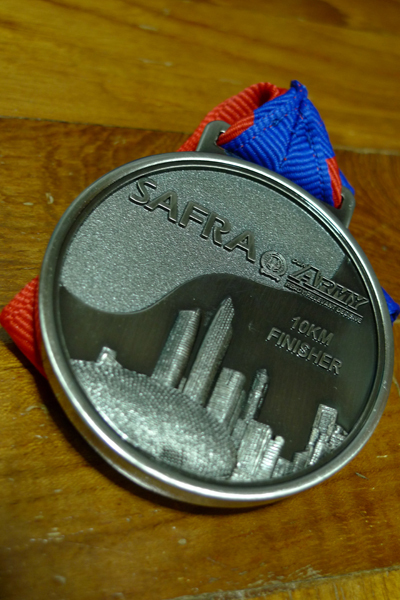 The most encouraging part of the run was at the F1 starting point area. 3 DIV (I think so, it's the DIV with the tiger one) had men with inspiration notes standing along the whole stretch of that road. Everyone who saw it will definately agree that I was inspiring to push them on to finish the run. 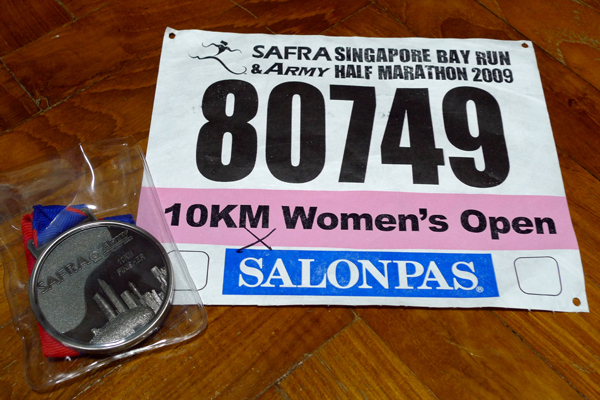 Number tag with finisher's medal. 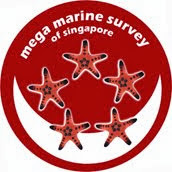 Hopefully, I can still consider to join SBR & AHM 2010. A few more run to go for the year.